So on Sunday I was planning to make my loaded corn chowder and then hit 100 degrees and I was like "Nope. Not soup." I took a bunch of the ingredients I had and made a salad instead. This is perfect to eat as a side at your end of summer BBQ or even on top of lettuce like I did. 1. 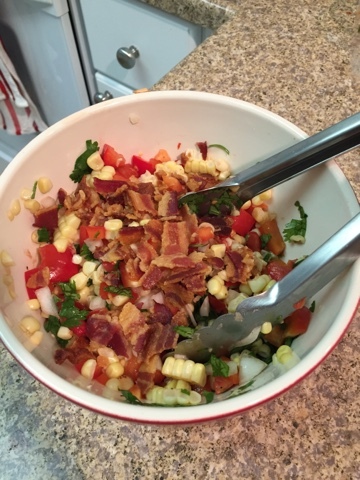 Combine corn, red pepper, onion and tomato in a bowl and stir. Juice a lime and add in chopped cilantro. Season with salt and pepper as desired. Enjoy!